The hardest thing you’ll have to do is switch the tabs at the top of your New Blog Post from “WYSIWYG” to “HTML” then you’ll just need to copy the code onto the HTML page where you want your iFrame to appear, then save it. Can’t make it much easier than that. So let’s start with the iFrame. 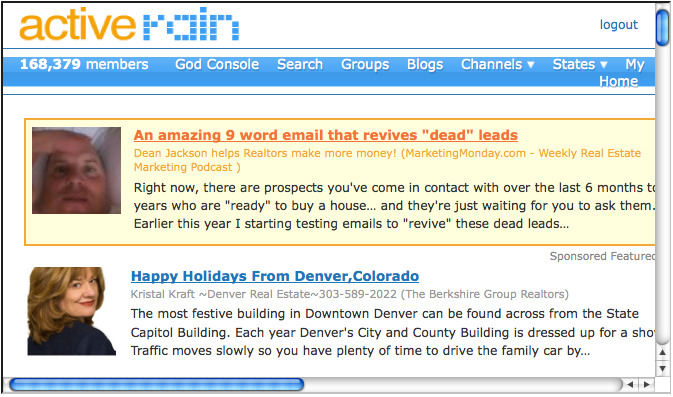 The purpose of Adding an iFrame to a Blog post is so that you can share a large amount of information in a very small (customized) space. Maybe a website, or an interactive page, or even an entire Blog for example. The size, color, width, height, URL, etc. can all be customized. Now for all you advanced HTML users and Bloggers, this is probably easy stuff, but for many of our members and friends, learning this type of stuff has been known to cause overdoses of Tylenol and in some extreme cases, even alcohol. So here’s a way for you to preserve your anxiety and stress for something a little more worthy…. I hope. Just enter the URL of ANY page you want to appear in your iFrame, never make it wider than 550pixels if you don’t want to Blow Out your Blogs sidebar, select any height you want, give it a name, set the alignment, maybe add a border with some color, setup how you want it to scroll, and generate the code for your Blog post. This is much easier than trying to explain the HTML which you’re about to see once you generate the code anyway. Once you become familiar with the iframe code, you won’t need the generator anymore. Now try it yourself. Suggestions: Try using your MLS page, your IDX page, your Website, one of your Blog posts, maybe your AR Outside Blog, any page that’s on the internet will work as long as you have the URL or website address. 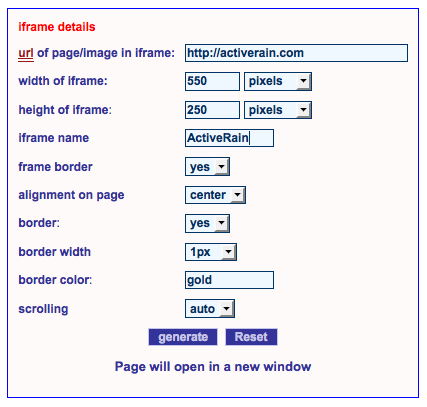 You can use iFrames to add some additional value to your Blog if this is something you’re interested in. Now just be creative and imagine all the ways your clients, visitors, and subscribers might benefit from your using custom iFrames in your Blog posts.